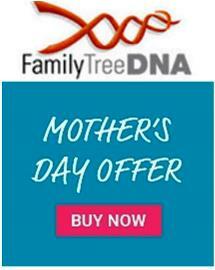 Family Tree DNA (FTDNA) has a special offer for Mother's Day, which falls this weekend in the USA. It's a $10 discount on FTDNA's Family Finder test, which focuses on the autosomal DNA inherited from your direct ancestors on both maternal and paternal sides. ancientOrigins – a tool that maps your ancient ancestors’ migration routes and shows the amount of autosomal DNA you still carry from ancient European civilizations. The $10 discount reduces the cost of the Family Finder testing kit from $79 to $69. Shipping is extra. The offer ends on Sunday, 14 May, and is available to all researchers, not just those in the USA.